The Day the World Discovered the Sun (Da Capo Press, 2012) tells the phenomenal story of scientists and explorers racing across the globe to observe a rare celestial event of outsized worldly significance. The "Venus transit" voyages of the 1760s – observing the planet Venus passing briefly in front of the sun – enabled solutions to two of the greatest scientific and technological puzzles of the age: discovering the Sun's distance and finding longitude at sea. The voyages also launched the legendary careers of Captain Cook and the surveyors Mason & Dixon. The sometimes death-defying expeditions helped transform a bookish scientific pursuit into the essential way-finding art of the times, cracking open the field of navigation and heralding a new age of global expedition, trade and conquest. 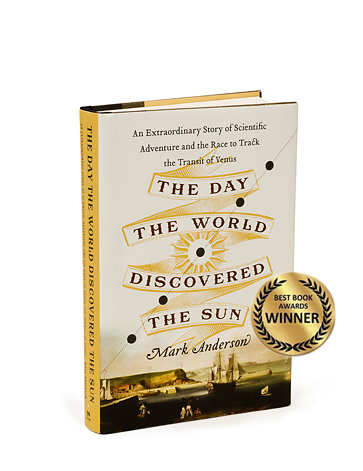 The Day the World Discovered the Sun is the winner of the 2013 American Book Fest "Best Book" Award in the History: General category. “In this exciting tale – part detective story, part history of science – Anderson ("Shakespeare" by Another Name) vividly recreates the torturous explorations and enthralling discovery of three peripatetic and insatiably curious explorers." "It's a heck of a yarn – a sort of real-life literal Star Trek from the era of tall ships, terra incognita, and scientific Enlightenment." "Truly excellent... Anderson writes as if the reader is on the very shoulders of the adventurers as they sledge across the icy wastes of Siberia or sail across uncharted oceans ... communicat[ing] the verve and energy – not to mention the perilous nature – of the expeditions." "A scientific adventure tale in which astronomers risk their lives, traveling the high seas in winter, trekking over ice-bound Siberia and facing deadly diseases... A lively, fitting tribute to 'mankind's first international 'big science' project.'" "This story has everything in it. It's got commerce. It's got politics. It's got science. It's got religion. Everything is crossing into everything else, and that's what makes it such a compelling read." "[An] excellent account... Arresting... Anderson serves up a rich broth of details." "It is rare that a history book can be described as genuinely suspenseful. Anderson’s narrative is exciting; his description of three different expeditions reads like an adventure novel." "A clever and very entertaining book... an adventure tale, a story of human 'drive and endurance' with voyages to the poles and everywhere in between to unlock a scientific mystery." "Shakespeare" by Another Name (Gotham Books/Penguin USA, 2005) is the biography of an epic, Shakespearean life. But the biography also contains a methodical, scientific examination of a historical mystery – without ever digressing from the book's narrative thread. Prominent authors, scholars and cultural icons have in recent centuries questioned the authorship of the Shakespeare plays & poems. Walt Whitman, Mark Twain, Sigmund Freud, Ralph Waldo Emerson, Henry James, Malcolm X, Mark Rylance, Daphne du Maurier, Orson Welles, John Gielgud, Derek Jacobi and many others have all expressed doubts that the actor Will Shakspere wrote all the works traditionally ascribed to him. Many Shakespeare scholars and professionals have instead suspected a politically-connected Elizabethan insider as the concealed author behind the "Shakespeare" mask. Edward de Vere, Earl of Oxford has emerged as the leading alternative "Shakespeare" candidate. "I think Oxford wrote Shakespeare," Orson Welles said. "If you don't there are some awfully funny coincidences to explain away." "Lear [can] only be understood psychologically on the assumption that Oxford is the author," wrote Sigmund Freud in a 1935 letter. "And... I believe Edward de Vere to have been the creator of all the other genuine Shakespeare plays." Freud elsewhere noted, "The man of Stratford seems to have nothing at all to justify his claim, whereas Oxford has almost everything." "I believe Edward de Vere and not William Shakespeare [of Stratford] wrote Richard II and, in fact, all the plays attributed to the man from Stratford," said the eminent Shakespearean actor Sir Derek Jacobi — who also wrote the foreword to "Shakespeare" by Another Name. 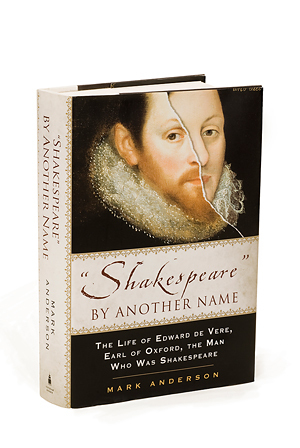 "Shakespeare" by Another Name is the definitive account of Edward de Vere's resoundingly Shakespearean life and times. With scholarly & critical acclaim and more than 150 five-star ratings on amazon.com and goodreads.com, it's also a comprehensive, gripping, page-turning read. Best-selling novelist and former Fulbright/Andrew W. Melon scholar Sarah Smith called SBAN simply "the most important Shakespeare biography of the past 400 years." As a freelance journalist & radio producer I have presented some of the material in SBAN for media outlets including PBS' Frontline online, NPR's Morning Edition, WNYC/Public Radio International's Studio 360, and Harper's magazine. "One of the very best whodunnits you will ever read." For: Anyone who likes mysteries, even the Bard-resistant." "Makes a compelling case... Anderson's demonstration of how de Vere's life matches the characters and circumstances found in the plays attributed to Shakespeare is especially impressive." "Quite a compelling argument. ... Anderson presents as detailed an account of de Vere's life as you may ever read. It's a fascinating subject, not only for the discussion of his being the "real" Shakespeare, but also for the historical examination of the Elizabethan period from a different perspective." "Deserves serious attention. ... The controversy over who wrote Shakespeare's works has reached a turning point of sorts. A new biography of the Earl of Oxford ["Shakespeare" by Another Name] improves on the unorthodox argument that he was Shakespeare." "Tantalizing parallels between the plays and Oxford's life certainly exist. ... Anderson has a knack for finding fishy aspects of the traditional view that Shakespeare was Shakespeare." "One of the most fascinating theatre-related books I have ever read. An absolutely first-rate piece of sleuthing and an absolutely first-rate read." –Don Rubin, professor and director of the graduate program in Theatre Studies at York University (Toronto) and editor-in-chief of the World Encyclopedia of Contemporary Theatre (Routledge). "The battle is won. In page after page, Anderson shows how characters and story lines in virtually every Shakespeare play reflect people, places, and incidents in de Vere's life." "An extremely well written piece of prose... and a rewarding exploration that serves to add ever more depth to our experience of the [Shakespeare] plays"
"A model of in-depth research, closely reasoned argument, and fine writing. I wish I had written it, and that's the highest compliment I can pay to any author." "'Shakespeare' by Another Name is a wake-up call. The wealth of new and revelatory corroborative evidence in this biography fleshes out Edward de Vere, 17th Earl of Oxford, as the man behind the plays of Shakespeare, and as the story unfolds the background to some of Shakespeare’s most important plays springs into life. Mark Anderson’s book will be a galvanizing force for actors and theatre people with its richly nourishing and illuminating information. No biography of the Stratford man is as persuasive. " The tip jar below helps defray costs the two research-intensive books above have incurred — and underwrites future work now in progress. Thank you!